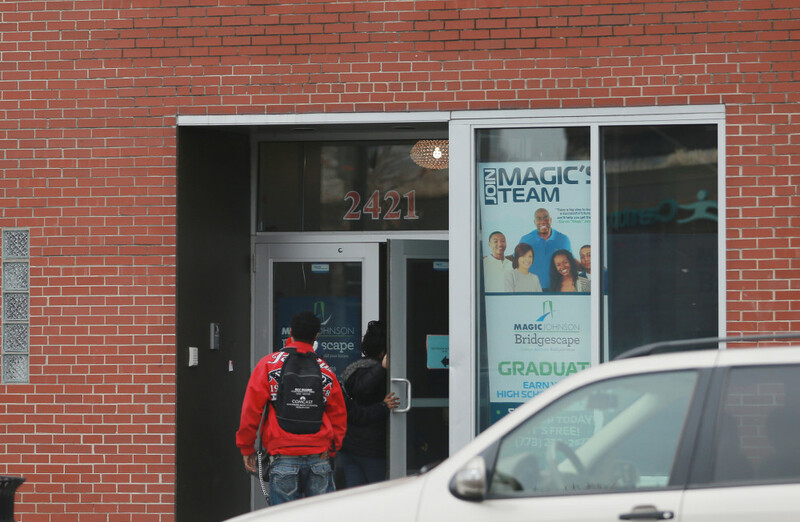 The Magic Johnson Bridgescape Academy in Humboldt Park is one of five campuses throughout the city. One of Mayor Rahm Emanuel’s significant accomplishments—which even his critics can’t completely take away from him—is the improvement in the high school graduation rate. It now stands at almost 70 percent, up from 58 percent when he was first elected in 2011. The mayor’s pitch for re-election includes a promise to raise the rate even further to 85 percent, which would put the city on par with the statewide rate of 86 percent. Under his watch, Emanuel says, a diploma from Chicago Public Schools has come to have value. If voters back him again,”[parents] will know that a degree from Clemente, South Shore, Back of the Yards, Taft, Westinghouse, Sarah Goode, Rickover means their children will have the education to succeed in college, career or life,” Emanuel said in a January speech during which he outlined his second-term education agenda. But a joint investigation with Catalyst Chicago and WBEZ’s Becky Vevea has found that the district is on a troubling path toward that goal as it turns to new, largely unproven, mostly online alternative schools to educate more students. In the process, the bar for graduation has been lowered for some students, and the groundwork is being laid for thousands more students to receive what some experts contend is a lower-quality diploma. Over the past two years, Emanuel’s administration has more than doubled the number of seats in new alternative schools—renamed “options schools”—by opening more than a dozen new campuses. In this, the first of three stories, Catalyst Chicago examines the quality of education offered by these options schools. The second story analyzes the impact of these schools on the city’s graduation rate. The third story will examine how options schools spend the millions CPS is sending their way. WBEZ’s initial story can be heard here. While they do have certified teachers and some small group instruction, especially for core subjects or when students are struggling, in general, these options schools rely on computer-based instruction, with little or no classroom teaching and discussion. In a week or month, students can whiz through a course that would take a year or semester in a traditional school. A 17-year-old boy told reporters he finished the equivalent of a semester’s worth of work in three days. Options schools mostly offer half-day sessions. Students fulfill the state requirement that they receive 300 minutes of instruction by promising to do work at home. Graduates are awarded diplomas from either the last school they attended or the neighborhood high school near where they live. Three of the four new multi-campus operators are out-of-town, for-profit providers and are already reaping hundreds of thousands in profits. CPS budgeted about $50 million for these schools this year, including generous startup funding. Options school budgets are filled with questionable expenses. One operator budgeted, and then paid itself for, more than $400,000 per campus for educational materials. With little public disclosure, few people–from experts on Chicago’s education system to principals who may send students to them–know much about how options schools function and educate students. Yet more than half of the 12,000 seats in alternative programs approved this year by the board are in options schools. This year’s tally is part of a major expansion in alternative programs over the past decade. In 2005, there were less than 3,000 seats; in 2010, the number had grown to 6,000. Of the 12,000 approved this year, not all are filled and some of the approved schools struggled to open. CPS officials say that the new schools offer students another educational choice. Jennifer Vidis, the district’s chief of alternative schools, says that an outside group commissioned to do an analysis found that there were 56,000 out-of-school youth in Chicago. At the time, the district had 5,000 spots for them. “We looked at this massive gap and we needed to do something to fill it,” she says. “We decided to expand and diversify the number of seats.” She says the schools run by these new providers are only one of many different types of schools offered by the district. Soft-spoken Estefany Herrera remembers her last days at North-Grand High School as long and stressful. Her friends turned on her and convinced others to tease her. They tried to fight her. In September 2014, Estefany found her way to Division and Western in Humboldt Park, about to enroll in an options school. About one hundred steps from the corner was a non-descript building with a sign in front that read: Coming soon, Magic Johnson Bridgescape. In reality, the school was already open. One recent day, an armed security guard sits at the front desk. The decor looks more like a tech startup than a high school, with hardwood floors, high ceilings and exposed brick throughout. One side has a conference room and an office; the other side, a long room lined with computers. As students file in, the school remains eerily quiet. Students wear headphones and stare at computer screens. Teachers walk around, sometimes stopping to help students, but mostly trying to make sure they stay focused. Camelot, on the other hand, has an eight-hour school day and students do less work online. Camelot’s Executive Director Todd Bock says that students who have dropped out need more time in school, not less. But like the other programs, Camelot students can get a high school diploma in a shortened period of time, typically two and a half years. Estefany starts her school day by logging on to the computer. On a recent Friday, she is working on Spanish 2 and spends about five minutes reading a short lesson—about one and a half pages—on verb tenses. Then she takes a five-question test on what she just read. Each class consists of about 50 lessons. Once Estefany has completed the lessons, she will have to finish a final that includes a multiple-choice test and three short essays. Yet she never really has to study for the tests–she can always look at her notes or go back to the lessons while she completes it. Every student has to take the final exam repeatedly until earning a score of more than an 80 percent, thus ensuring that all students pass every class. As a Spanish-speaker, Spanish is easy for Estefany and she expects to be able to complete the class within days. But even some of the harder classes have not taken her a long time. For example, World Literature, in which she read Shakespeare’s Romeo and Juliet by herself on the computer, took her only a week to complete. She worked on it just two hours a day. That is 10 hours, compared with the 135 hours that a student in a traditional high school would normally spend in a World Literature class. Geometry was one of the harder classes. “It took three weeks,” Estefany says. About twice a week, Estefany logs on to the computer at home to do some work. But she feels no pressure to do so. “It is just if I want to get through the work [quicker],” she says. In five months she has earned nine credits. Typically, students earn six credits in an entire traditional school year. Estefany, once considered for the National Honor Society at North-Grand, might work at a faster pace than other students. But even one young man who says he has been slacking off reports that he’s earned three and a half credits in the five months that he has been at Bridgescape. British Literature, in which he had to read Shakespeare’s Hamlet, took him three weeks. He says he could have done it in two weeks if he had been focused. But the selling point to students is speed and getting a diploma in record time. Pathways’ website reads: “Graduate High School Faster, Free Programs & Classes, Flexible Scheduling. Get Ahead!” Its URL: www.makeupcredits.com. At the Ombudsman campus on the South Side, the principal keeps a running tally of credits earned. One day in early November, just two months after the school opened for the year, Conrad Timbers-Ausar points to the wall in his office, which is lined with helmets from NFL football teams. The helmets represent classes at Ombudsman. Next to each helmet are stickers of little graduation caps. The concern by some educators about these programs is that they are too fast, too easy and not rigorous enough to prepare students for college and careers. Elaine Allensworth, Lewis-Sebring director of the University of Chicago Consortium on Chicago School Research, says that when the Consortium originally proposed the formula the district now uses to calculate graduation and dropout rates, they recommended that students who completed an alternative school program not be included as graduates. At the time, alternative schools didn’t have to meet the same graduation requirements as traditional schools. The Consortium is looking into the district’s claim that alternative schools, including the options schools, now meet the same requirements—allowing their graduates to be included in the citywide graduation rate. Allensworth was surprised to learn about the options schools. “Whoa,” she said, seemingly floored. Though other states have had similar programs for years, there’s little research on how successful they are with students. CPS is one of the few districts to design a rating system for them, and the early results are troubling: 80 percent of the recently opened options schools had below-average ratings, compared to only 21 percent of traditional alternative schools. The ratings are based on whether students perform better at the alternative or options school compared to their previous school; for example, whether their attendance is better. Traditional schools are judged based on overall performance—for example, the raw attendance rate—as well as whether students and the school have improved. Sonja Santelises from the Education Trust, an organization that focuses on education equity, says that schools like the new options schools are not necessarily bad just because they are fast-track or operate on a non-traditional structure. But districts must be extremely careful as they consider launching them. Matt Rodriguez, principal of Pedro Albizu Campos Puerto Rican High School, a 40-year-old alternative school, is skeptical. “Programs that only focus on credits completely lower the bar on what that piece of paper means,” he says. That supportive approach is something that these students desperately need, says Wuest of the Alternative Schools Network. In his experience, returning dropouts need to be in small schools that can offer a lot of individual attention. Even the district officials who opened the door to the options schools admit they do not know how well they will work and say they will abandon the approach if it backfires. Vidis says those that don’t meet quality standards will not be allowed to expand and will be closed down. Gary Miron, professor of evaluation and measurement at Western Michigan University, notes that charter school operators are now getting into the business of alternative schools. One reason, he says, is that the bar for performance is much lower for alternative schools. “These programs are pretty lucrative because there’s not as much competition and at the same time, less accountability,” Miron says. Santelises says the real danger is the potential creation of a two-tiered district that provides high-quality education to one group of students and a substandard one to others. Another red flag: The students who end up in Chicago’s alternative schools are 70 percent black and 95 percent poor, while the district is 40 percent black and 85 percent poor. When Estefany decided that she wanted to go back to school, she had several choices. Magic Johnson Bridgescape sits in the shadow of Clemente, the neighborhood high school. Clemente now offers an International Baccalaureate program, which CPS launched in a number of neighborhood schools to offer a more rigorous, global education for students who don’t qualify for an elite selective high school. Students are in school from 8:00 a.m. to 3:15 p.m.—seven and a half hours. To the west on Division is Campos High School. The main campus is above storefronts and overlooks Division Street, where a 59-foot Puerto Rican flag sweeps down. The walls are brightly painted in yellows and blues—vibrant colors that reflect Puerto Rican culture. Inside, the small classrooms look like regular classrooms instead of being lined with computers. Like Clemente, Campos has a long school day. But Estefany says her bad experience at North-Grand turned her off of traditional high schools. Some of the alternative schools or GED programs weren’t appealing either—they took up too many hours. Yet she has dreams and knows she won’t be able to go after them without a high school diploma. Her goal is to go to college and become a counselor so she can help teenagers who are going through hard times, like she did. She believes that her education at Bridgescape will prepare her for college. So far, there’s little evidence that she is right.